Rec. Studio No. 5, KULTURA State TV & Radio Company, Moscow, 14-17 March 2003. Scherbakov has an impressive list of recordings for the Marco Polo and Naxos labels. I have been greatly impressed by his Respighi � both solo piano music and the piano concerto � as well as his interpretations of Liszt�s transcriptions of the Beethoven symphonies. Now comes a version of possibly the most-recorded of all piano concertos. Here he has to compete with all the great names. Two questions immediately pop up: Does he stand a chance against the formidable competition and do we really need another version of this war-horse? The answer to both these questions is a resounding YES! This is the first SACD disc I have listened to in real surround sound and of course it adds something to the feeling of being present in the recording venue, but the difference from a normal two channel recording is not that great. Actually, when I switched over to front speakers only the recording gained in clarity. In whatever mode you listen it is a good sound, a bit bass heavy, but that can also be due to the placing of my sub-woofer. There is admirable balance between soloist and orchestra, the piano sound is very life like and orchestral tuttis are impressive. I soon forgot about sound quality and concentrated on the playing, and yes � this pianist has something to offer that definitely puts him on a par with many of the greats. He is a formidable virtuoso and can produce steel fingered athletics when required but what impresses most is his lyrical playing. Time after time he shows us the beauty of the music, the warmth of feeling and he doesn�t over sentimentalize as some pianists do. The score tells us that Scherbakov is faithful to the composer�s intentions. Listen to his handling of the transition before the Allegro con spirito (bar 110) in the first movement, where he grades the dynamics marvellously. In the Allegro we also notice the fine interplay between soloist and orchestra. Yablonsky and Scherbakov obviously feel the music similarly. The dolce e molto espressivo (from bar 194) is also wonderfully played, while the long cadenza, starting at bar 540, is itself worth the price of the disc: one is left breathless after this demonstration of sensitive playing. It is so beautiful! The orchestra also play well with some fine woodwind solos and although there is no lack of power, Yablonsky never yields to the temptation to let his musicians pull out all the stops and tip over into vulgarity. This is noble music-making from all involved and it raises the music to a higher level altogether. The slow movement gets a beautifully hushed start, the flute solo played dolcissimo as written, and then the prestissimo gets the right rhythmic swing, while the final movement is fiery with a lot of rhythmic élan. Indeed, this is a truly great version of this oft-played piece. This performance actually made me listen with newly-opened ears. There is a quite substantial filler � or rather two. 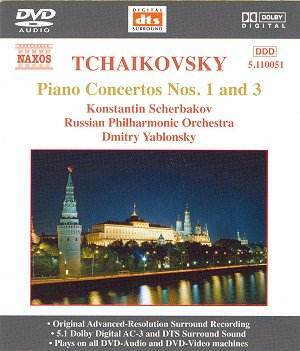 Of what was supposed to become Tchaikovsky�s third piano concerto only the first movement was completed and published as a separate concert piece. As such it has been recorded several times but as far as I know it is rarely performed in concert. I have never come across it live, and that is a pity, since it is a fresh piece, that in the hands of a virtuosic pianist can be a real tour de force. That is certainly the case in this recording. Here it is �completed� with Taneyev�s revision and scoring of the composer�s sketches. This music is also worth a listen, although it is not on the level of the B flat minor concerto. As a vehicle for a well-endowed pianist like Scherbakov it is agreable, but having played the disc straight through at one sitting I couldn�t withstand the temptation to play it once again � and then again. And I urge readers to do the same. Yes, Scherbakov belongs to the Pantheon of great pianists. We need this recording of the concerto in spite of the catalogue being flooded with other versions.